There's a new track on the Northern California scene, and it's pretty terrific. And it's not even in California. July 17, 18, 19 was the first weekend that Reno-Fernley Raceway was officially open for business, and even though it really wasn't ready yet, we had a ball. The track is currently 1.2 miles long, and it will grow to 2.4 miles on April 1, 2004... It's slated to be be a full 3.8 miles (!) for its grand opening, late in 2004. There's almost no overall elevation change at present, (maybe 30'? ), but it will have challenging hills and hidden turns when it's completed. In its current (short) form, it's like a long oval, with hairpins at both ends, a series of 4 "esses" on one side and 4 off-camber turns on the other side, 2 of which are blind and pretty scary at high speed. The only wall is after the second hairpin, Turn 10, right at pit road. But the roadway is nice and wide, fitting 3-cars-across where passing is likely. This track is really sweet, and without wanting to sound too peotic, I have to say that there is an "undulating rhythm" about it that reminds me of Watkins Glen, and even more so of the back half of Bridgehampton (R.I.P.). These guys know what they're doing. This is going to be a great track! I'm kind of glad to have discovered it before they made it into a full-sized track, and before a crush of racers start running there. The few of us who went to the July event really didn't expect much - we mostly went to check out the new track, and to tune and set up our cars. But what a pleasant surprise! NorCal NASA director Jerry Kunzman and his team did an amazing job of putting this thing together with spit and chewing gum, and the results were just great. Even though Jerry's GF Theresa was the PA system, walking or riding a golf cart up and down the paddock with a bullhorn, all the events went off on time, and without a hitch. And it was especially neat that since it was only half-full, we had 5 HPDE sessions per day, with extra laps and time to spare. The HPDE and race officials made sure to warn everyone up front about how dangerous the track was..., because it's still under construction. Having only 4 corner workers on the track appeared questionable at first, too, but the track is so flat right now, they could see any problems right from Timing and Scoring. You really didn't need more workers. 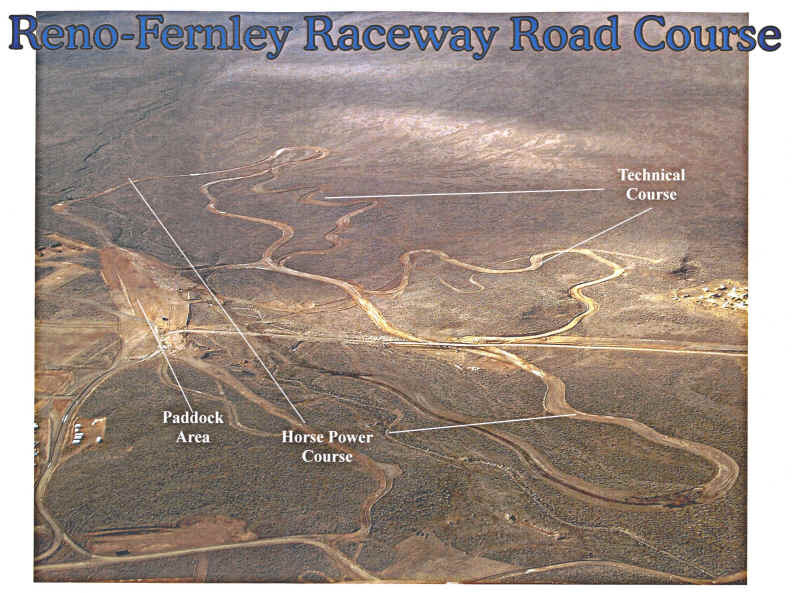 Both the Reno-Fernley track people and NASA deserve high praise for actually pulling this off. In the middle of nowhere..., 110+ heat..., track not even half built..., no buildings..., one water spigot..., and none of us even noticed anything but a great day at the track. Kudos to all of them! And I guess we should give ourselves a pat on the back too, for being smart enough to exercise a bit of extra care on the new track. Except for a Pro-7 that flipped upside down on top of the pit wall by coming out of Turn 10 too hot, (and he hit it the next day, too), another Group 4 racer plowing off in Turn 5 backwards, and a fast Vette playing "lawn girl" and getting a dust bath in the Turn 6 gully, all other incidents that I saw were were minor. When I came back from one of my runs (back in July), I was just taking off my helmet when a "cherry" 1994 yellow Stealth TT drove by, and I yelled out, "Hey, Stealth", thinking it was a Team3S member who decided to stop by. It turns out it was the guy who's building the track, Bob ???. He gave me even more of the details about the construction schedule and it IS rigorous. That first weekend, there was only enough paved area to park the cars that were going to be on the track - everyone else-- visitors' cars, trailers, etc., had to be parked on the adjacent gravel areas. Many of those areas had been upgraded by the time we got back in October. On our first visit, there were no facilities, other than a few porto-sans and a single cold water standpipe with no hose. They got high marks for improvisation, though, since using a 50-year-old red Coca-Cola shack for Timing and Scoring was really cool. We were assured that running water, more paving in the paddock and at least a few buildings were on their high-priority "to-do" list. And indeed, for our fall visit, we felt like we were "back home" in Northern California, since Reno-Fernley's Rich Cable bought up some of those great trailers that Thunderhill Raceway no longer needed after their big renovation. It's amazing how much more comfortable the track is with a few more facilities! There's just something about the place that's a bit surreal - like being on a hot planet somewhere in another universe. Around 5 pm that first Saturday in July, at the NASA BBQ, we heard one of the locals say, "Uh-oh..., here comes the tornado!" And out of nowhere, a damn cyclonic wind blew in that took down tents and blew half of our BBQ off the table. 10 minutes later, it was calm again. It turns out that this demon wind happens every afternoon as the sun starts going down. And in case you think I'm exaggerating about the "Wild West" thing, they had to interrupt the driving event schedule during the day-- a bunch of wild mustangs ran down from the mountains and decided to come see what all the noise was about, and started dancing around the infield of the track! I'm surprised that they let Nevada become a state - there are NO rules there. Even the horses know it. I love that place! There's about a 1/4 mile main straight past the hot pits. Stay right next to the wall and follow that line until you shift - you'll know you did it right when it looks like the flagman is ready to jump! Shift into 3rd about 200 meters before the esses, and point at the turn-in "sweet spot"..., that being just a few feet off the Turn 1 berm. Each ess is smaller than the previous one, so hitting Turn 1 just right is most important - if you don't, it will throw you off for the next 3 esses, and leave you out of position for the hairpin at Turn 5. You reach the left ess of Turn 1, which dips down toward the berm and unsettles the car as you come out of it. The dip throws throws you a bit wide left for Turn 2, an ess in the other direction that's almost flat, so at speed, you'll need some throttle steer to get you over there. Turns 3 and 4 are almost a replay of 1 and 2, but on a smaller (and faster) scale. Turn 3 is a left ess over a slight rise that tries to spin you counter-clockwise, since you take it at well over 100mph. You've got to back off the gas just a bit and wait for the suspension float to settle (or preferably, trail brake slightly), then gun it over the right sweep of Turn 4 and the short, very slightly downhill straight that approaches the Turn 5 hairpin. For the hairpin, you've got to point your car at the left middle of the track as you get past Turn 4, (it's flat and there are no landmarks there yet), and brake hard in a straight line until you reach the turn and go into 2nd gear. You blow off the first part of the hairpin, 5a, and run wide (about 2/3 of the way out), then accelerate and turn hard to throw the car into a slight drift as you approach 5b, as if you were about to do an early apex. Floor it through the rest of the turn as you unwind the steering. You'll drift out toward the edge at 5b, since you're already carrying pretty good speed going into the turn from that fast straight. But the AWD will grip just in time, before you go off the edge opposite the berm at 5b, and you'll find youself pointing right at the berm that's maybe 100 meters ahead, which is maybe 50 meters before Turn 6. Shift into 3rd and pass an inch off the berm at ~80% throttle. Once you get past Turn 6, if you haven't carried too far left, you'll kind of feel like you're "home free", since you can see the berm at (off-camber left) Turn 7. But the elevation change is misleading to the eye. You'll have to power the car a bit right and resist the temptation to mid-apex that Turn 7 berm. Don't do it. Take it late, or you won't be in position for Turn 8. Since you can see Turn 9 easily from 7, you should be already planning how you will approach it. You should be at WOT up to this point, and the suspension will unload as you go over Turn 7 if you don't back off a bit just before the crest. It's also a perfect place to trail brake to shave of a little speed, then shift into 4th and start counting as you get on it again going through Turn 8. I found that a four-second count ("one-one-thousand, two...") was the right duration before shifting back up into 3rd. Turn 8 seems like an easy right - stay off the berm and point right to 9. But a good driver learns that there is a better way... By staying to the right after 8 and taking Turn 9 about a car width off the berm, your car will be positioned at a better angle - both for straight line braking, and for not pointing into the hill at 140 mph. I almost lost it right after Turn 9 simply because I don't have big brakes, and I barely slowed enough to avoid going off track, almost on to the egress road, behind the cones. Stocker brakes just won't stop you in time, so you have to back off. I couldn't go over the crest of Turn 9 safely at anything over 125 or so. By going far to the right at ~120, however, I was able to brake smoothly and still set up for the Turn 10 hairpin. When I got down to about 80, I shifted to second and switched to left-foot braking as I accelerated through the first part of the 10a hairpin. By staying right at the cones and trail braking, you can keep the turbos spooled and start accelerating hard as soon as you are perpendicular to the wall. The car is nicely settled by then, so you can turn hard and go right past the berm in a late apex as you let out the steering until you're right next to the wall on the main straight again, right where you started. Eileen practiced on the track all day Friday (I didn't, since I was still trying to datalog my engine for maximum safe power in the thinner air), so she was really sailing around the track in that little Spec Miata on Saturday. She had a best lap time for the 1.2 mile track of 1:02. Pro driver Al B. managed to break a minute driving her car - his fastest lap at 0:59.885. By the time the weekend was over, "ET" was scooting around the track consistently in the low 58's. Pretty quick for a "putt-putt" Spec Miata! (Oh, sorry..., a "zoom-zoom"). LOL! My "Track Car" Gets "Dialed In"
The subtle undulations of the track surface are brilliantly designed for really fast cars with tight suspensions. I had one of the 5 fastest on the track in my group, even with stock brakes - a credit to that unbelievable JIC suspension... I ran in HPDE Group 4, but I'm in the NASA TT (time trials) program (with an in-car transponder) so I got the printed lap readouts from Timing and Scoring. In my first session ever on the Reno-Fernley track, my best lap time was 1:02 (1:01.998); in my second session, it was 1:00 (1:00.243). But in my third session I broke 0:59 (0:58.825)!!! Yay! For those of you who don't want to do the math, that's an average LAP speed of just under 73mph! As a point of reference, the fastest pros in the Porsche race group were running ~0:55; the fastest Pro-7's, race-prepped Spec Miatas, Hondas, and RX-7's in the Enduro ran best laps ~0:56. On stock brakes with race pads, running practically no negative camber, in a 4100lb car..., I'm VERY happy about getting into the 58's! One final blurb about the "five fastest" in Group 4. I've already told you about the husband/wife team in their matching Vettes - pro drivers in fast cars, with lap times around 55 seconds... But the other 3 were: a WRX (also AWD), me in my VR-4, and a spanking new $200k Porsche Targa with decals all over it. The guy just bought the Porsche for about 150 large, put in over $20k for custom paint and detailing and another $30k in wheels, tires, mods... He wasn't upset about the Vette girl or her hubby passing him- both cars are set up perfectly and driven by licensed pros. And I don't think that he was even upset that I walked him pretty easily down the straight - he's an older guy (my age) and he and I had talked about the mods in my VR-4. My car is faster and corners almost as well as his... He could live with that. But what really pissed him off was when I passed him and then the WRX passed him too! We were like two ugly old rockets coming by him like he was parked. No..., the WRX was not one of those spanking new ones in that 'day-glo' blue... It was an instructor in a dirty old silver WRX SUV with a ski rack on top and a bike rack on the back! LOL! After that, the Porsche guy pulled off the track and went to his pit area and was kicking the sh*t out of his rear tire, like "to break his ankle". I had tears in my eyes I was laughing so hard! Another fun weekend..., at a great track... DAMN!, I love my VR-4! Article © 2003-2004 Bob Forrest, All Rights Reserved. Track Images © 2003-2004 Reno-Fernley Raceway, All Rights Reserved. Used with permission.